Day and night, plangent Sikh hymns roll across the water. Every day thousands of Sikh pilgrims from all over the world stream through, bathing in the holy waters and prostrating themselves before the holy book. Outsiders are welcomed: two years ago the Queen and Prince Philip were given a tour of the complex, and a model of it to take home as a souvenir. But despite all the love and attention, the Golden Temple in the northern Indian city of Amritsar is under dire threat – ironically, from pious Sikhs who devote all their spare time and money to the shrine. In the name of renovation and improvement, groups of karsevaks, or volunteers, throw themselves into doing their bit for the temple. Prominent among them is a group of British Sikhs from Birmingham, the Guru Nanak Nishkam Jatha. But nobody in the temple exercises informed control over the renovation work that gets done, with the result that this 200-year-old masterpiece is being steadily defaced, distorted and vulgarised. In an octagonal nine-storey tower erected 200 years ago in memory of a nine-year-old martyr, 19th century frescoes depicting the life of Guru Nanak, the religion's founder, have been scraped off the walls and replaced by avocado green bathroom tiles. The holiest spot in the complex is the Harimandir Sahib, the Abode of God, in the centre of the lake, reached by a 200-yard causeway. This is where the holy men sit continuously singing hymns, while devotees troop in and out. The upper part of the Harimandir gleams golden: the copper plates it is made of are thickly covered in gold leaf. 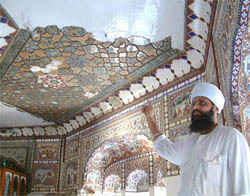 The entire roof has recently been renovated by the Sikhs from Birmingham, a work that took four years to complete. But experts in Sikh architecture charge that, in their zeal, the craftsmen hired by the Birmingham devotees have done irreparable damage to the roof, plastering cement over paintings which lay underneath the original copper sheets, thereby destroying them. The Akal Takht is the other holy spot in the complex, the building to which the holy book, the Granth Sahib, is ritually carried every day. The original structure, a delicate brick pavilion, was blown apart by Indian army tanks in 1984, when Indira Gandhi demanded that secessionist Sikh terrorists who had seized it should be killed. Afterwards the pavilion was razed to the ground and rebuilt – but the replacement is a hulking ferro-concrete building with none of the grace of the original. The stream of believers and the singing of hymns ensure a serene mood inside. But the canopy suspended over the holy book, garish pink and fringed like a bedcover, alerts one to the fact that Sikh aesthetics are not what they once were. Upstairs on scaffolding, Harbhajan Singh and his sons, local artisans, are painting the ceiling. Their work is precise and highly detailed, but the colours they use – cream and orange and blue and yellow and pink – would look more at home on a carousel in a fairground. "Did you have this colour scheme approved by the temple authorities'" I asked him. "No, no, I chose it myself," he replied. "I don't have to get permission from anyone. I've been painting here since 1955. Nobody tells me what to do." For many years, educated Sikhs have kept quiet about the stealthy, well-intentioned desecration that is overtaking the Golden Temple and other of Sikhism's historical treasures. But now they are making their indignation known. "These people are showing utter lack of sensitivity towards our heritage," says Patwant Singh, a noted authority on Sikh art and architecture. "Despite the resoluteness with which Sikhs have risen to every challenge, our generation has not been able to face the challenge of conserving its heritage." Gurmeet Rai, an architectural historian who has made a systematic study of the historic buildings of Punjab for Unesco, said: "They are killing the essence of what the religion is. People are concerned – believers are concerned about it – but nobody is organised to make their voices heard." The crux of the problem is the way the Golden Temple and all other historical gurudwaras – or temples – are run. The controlling body is an organisation called the Shiromani Gurudwara Parbandhak Committee (SGPC). But it is said to be riven by factional politics, and has no conservation experts to guide its policy. Patwant Singh said: "The SGPC has more money than they know what to do with. They must stop all physical intervention by outside bodies like the Birmingham group. They have to establish that no historical gurudwaras will be touched unless the work is vetted by them." t of the Birmingham Sikhs have left Punjab now. One who remains, an elder named Mehnga Singh with a kindly face and a magnificent long white beard, complains of false accusations. "It was quite wrong to blame us for putting bathroom tiles in the Babar Atal," he said. "That was nothing to do with us. We only did the gold leaf work in the Haramandir. And we have nothing whatever to do with the SGPC." Both SGPC spokesmen were out of town and unavailable for comment.